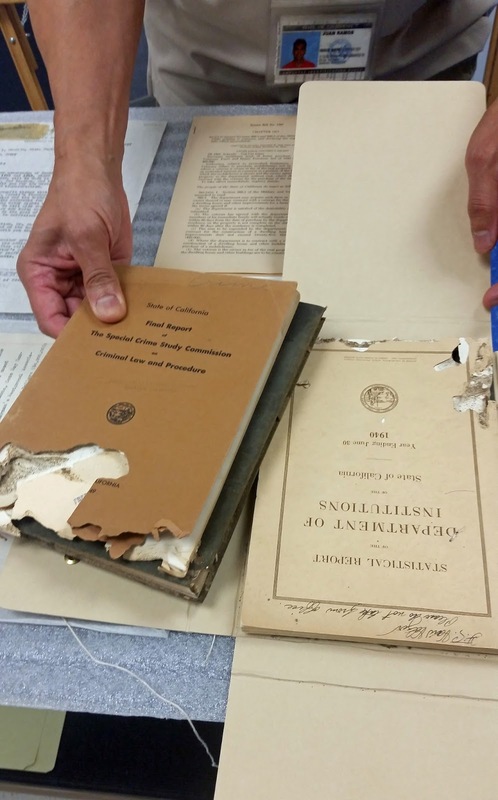 pieces of California memorabilia preserved and protected by State Archives staff. 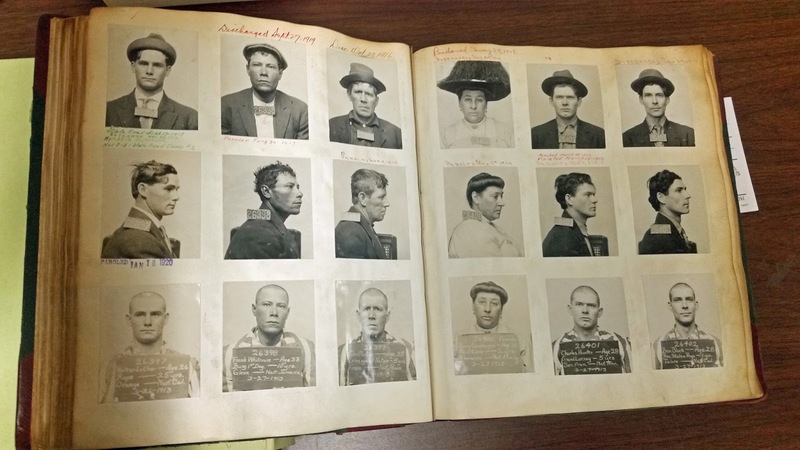 California’s capital city of Sacramento may be all about politics, but it is also a treasure trove for genealogists. 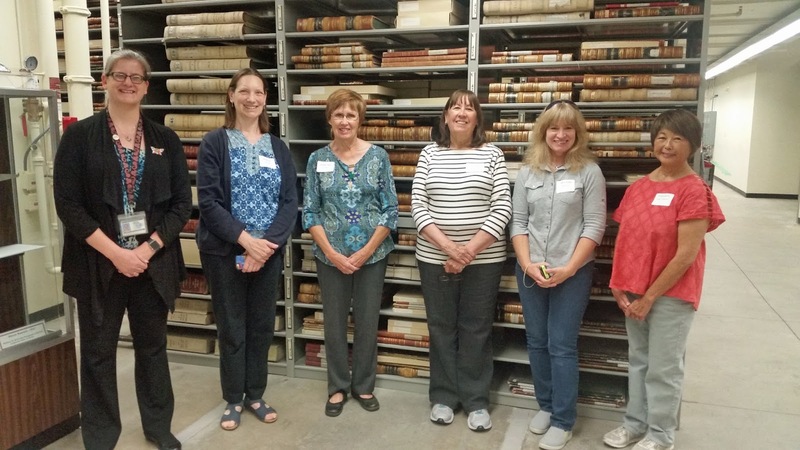 Recently, a small group of California Genealogical Society (CGS) members showed up in the capital city for a “behind the scenes” tour of the State Archives, located in the building occupied by the Secretary of State and the California Museum. 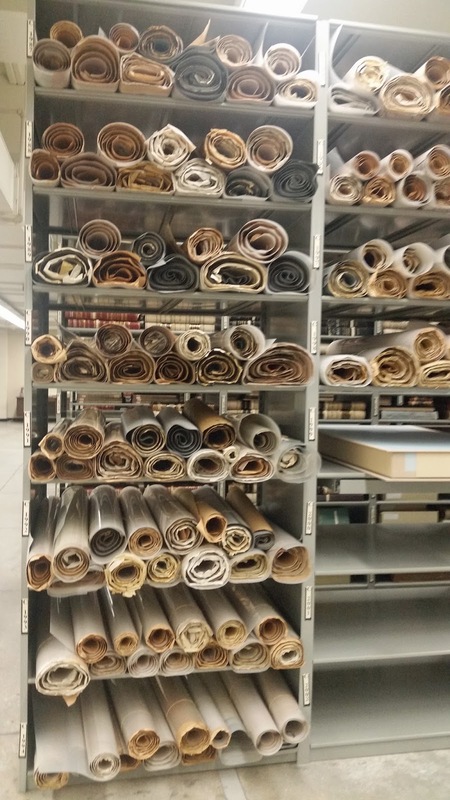 Although the State Archives was established in 1850 primarily to house records of California state agencies, the governor's office, the state legislature, and the State Supreme Court and Courts of Appeal, it also contains many genealogical resources. It is one of the biggest archives west of the Mississippi. Jessica Herrick (left) before exploring the stacks on the 4th Floor of the California State Archives. 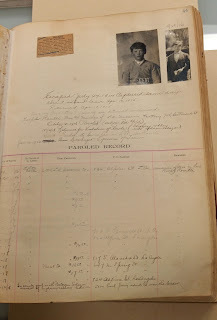 Archivist Jessica Herrick told CGS members that its list of Collections & Catalogs includes photographs and some census, county, mental health, military and prison records. 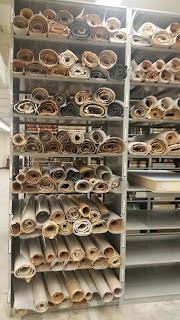 room of the California State Archives. In addition, there are records for Supreme and Appellate Court cases, Common School Reports, Articles of Incorporation, Trademarks, and Professional and Vocational Licensing files. is an ongoing project for the State Archives staff. The 1852 state census is on hand, as well as the 1860 and 1889 Federal Censuses. County records from 1850 -1987 are housed at the Archives and include probate court case files, wills, naturalizations, deeds, homesteads and vital records for more than 20 counties. Common School Reports (1862-1960) include school districts, student attendance figures, grades taught and names of teachers. 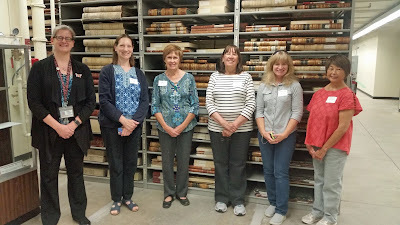 the preservation staff at the California State Archives. 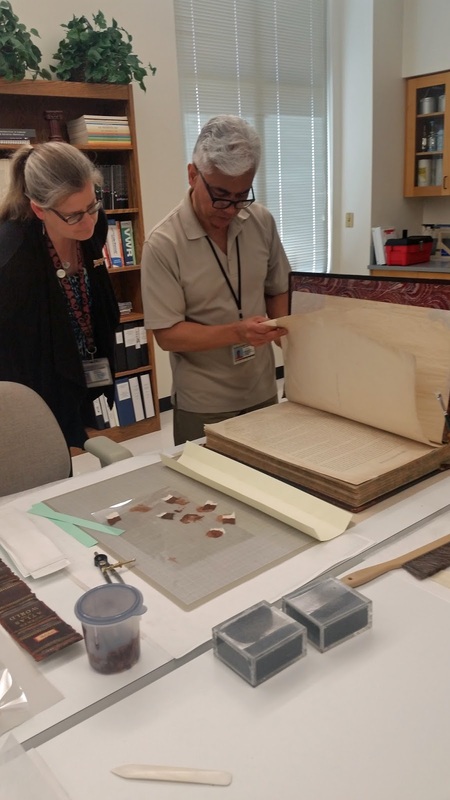 In addition to housing important documents related to the history of California, the Archives is also tasked with preserving older documents, books, maps and ephemera. on an 1892 World Atlas. Juan Ramos, Document Preservation Technician, led CGS members on a tour of the conservation lab, showing some tools of the trade. He also pointed out some of the well-intentioned, but destructive attempts at preservation in the past – cellophane tape, laminate and glue. Genealogists are welcome to visit the State Archives to do research. It is recommended that you call prior to your visit so staff members can pull any relevant records and make your research easier. Want additional information? Click here for more about the California State Archives, its mission and programs.